Nature gave us some of the best foods to cure our health. Walnuts are one of these healthy foods that can keep your mind and body in good condition if you eat them regularly. The major health benefits of walnuts include good skin, healthy hair, brain health, cancer fighting properties, improves heart health, prevents diabetes. Each compound in walnuts have their unique feature of improving the body functioning. The nutritionists and health experts worldwide suggest advice eating this healthy food daily. Cancer Fighting Properties: The research studies found that walnuts can lower or reduce the growth both the breast cancer and prostate cancer. Eating handful of walnuts daily may help in prevent cancer and other biggest health disorders. So add it to your favorite recipes or eat directly. Improves Brain Health & Fights Stress: Do not worry if things are not going right at your workplace, school, home or anywhere else, walnuts can keep your improve the health of your brain thus supporting in relieve you from stress. The folate, omega-3 fats, vitamin E, antioxidant and melatonin are the compounds in walnuts that have good effect on neural system of the brain. The brain ageing is slowed down when you consume walnuts daily. Prevent Diabetes: The studies have shown that people who consume a quarter cup of walnuts daily can notice significant reduction in fasting insulin levels. The dietary fat from this magical food contributes in metabolism with type 2 diabetes people. Walnuts Health Benefits for Skin: The most visible part of our body is the skin and walnuts properties like high levels of vitamin B and antioxidants prevent or slows down the skin ageing and protects wrinkles and damage and gives natural glowing skin. 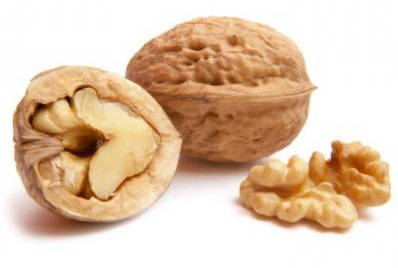 Hair: Eating walnuts or applying walnut oil to hair can help in hair growth and improve overall condition of hair. The potassium, omega fatty acids contribute in getting stronger, longer, shiny and healthier hair. The natural moisturizing properties of walnut oil can prevent hair problems like balding, dandruff and dermatitis. Heart Health: The most vital functioning organ of our body is heart. The compounds like amino acid l-arginine and alpha-linolenic acid prevents blood clots and other cardiovascular diseases. These compounds actually improve the functioning of heart and reduce the chance of attacks. So this is best time to start eating walnuts and add them to your recipes for healthy eating.